Compare the two animation from 0100-0500 above, showing GOES-R IFR Probability fields (top) and GOES-13 Brightness Temperature Difference fields (bottom) from shortly after sunset on 30 October 2016 until Midnight. 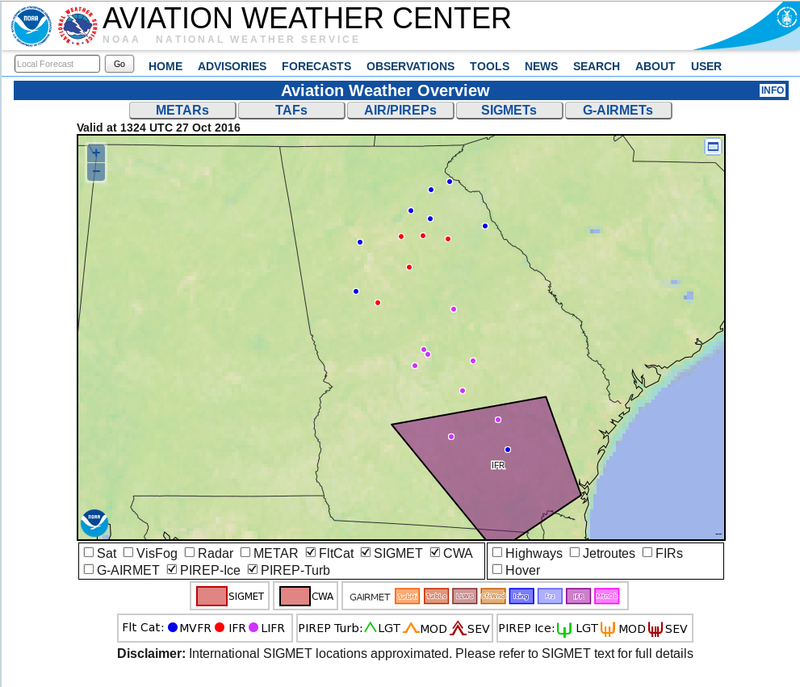 IFR Probability shows very little signal at first, and IFR conditions are rare (Jack Edwards Airport near Gulf Shores AL report IFR conditions). IFR Probabilities increase slowly in the next 4 hours, especially in regions where IFR conditions develop. In contrast, the trend in the Brightness Temperature Difference field is a slow decrease in areal coverage with little spatial correlation between a strong signal and IFR reports. 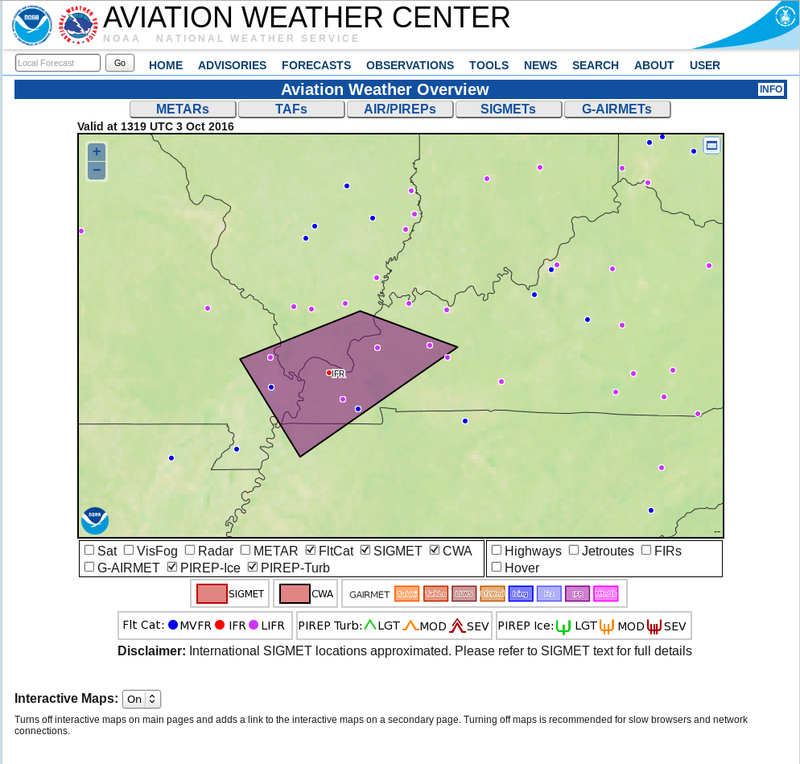 These animations demonstrate a strength of IFR Probabilities: By combining satellite information with Rapid Refresh predictions of low-level saturation, a better estimate of visibility restrictions can be created. Subsequent to 0500 UTC, in the animations shown below, IFR Probability fields expanded as IFR conditions developed over western Louisiana and southern/eastern Texas; a strong signal develops in the brightness temperature difference field in these regions as well. 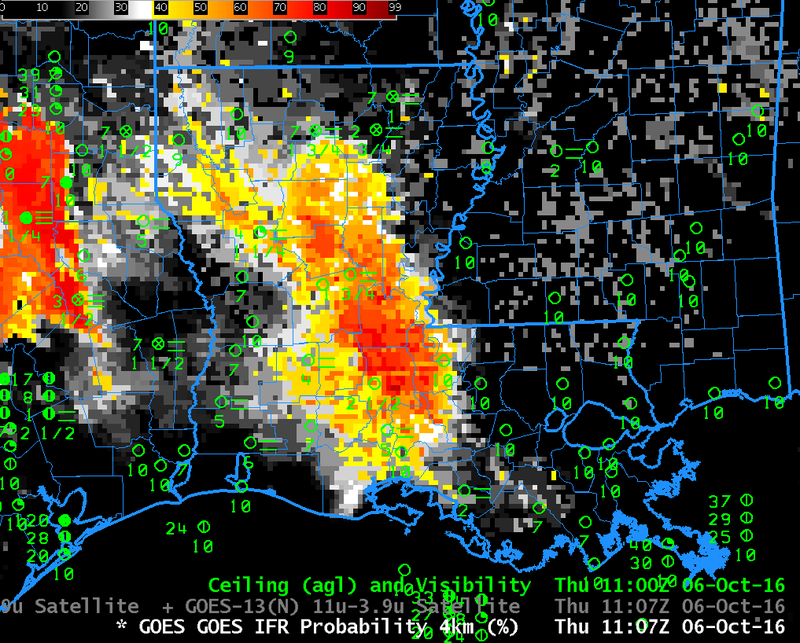 Note the lack of signal in the GOES-R IFR Probability field over Alabama and Mississippi where Brightness Temperature Difference fields show a consistent signal (and where IFR Conditions are not present). 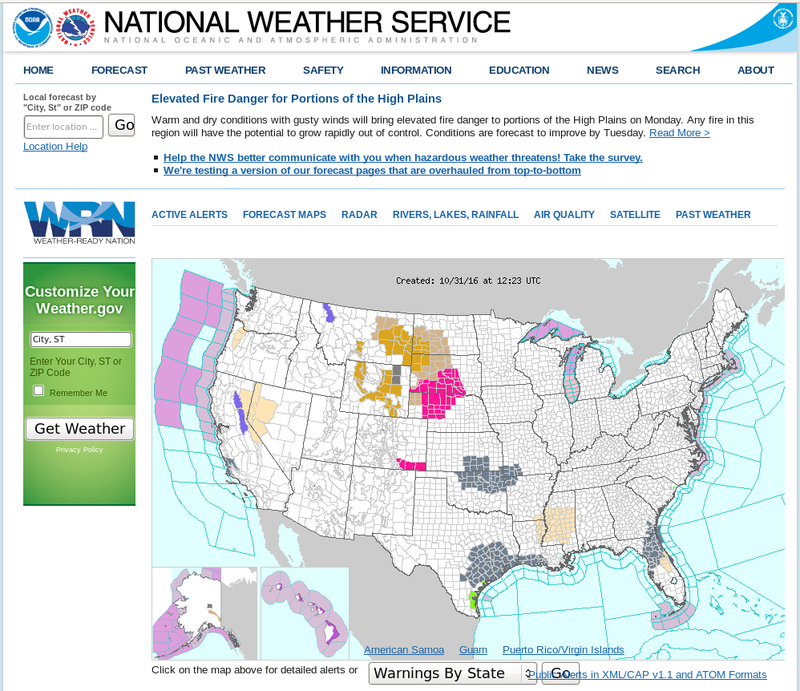 Brightness Temperature Difference signals over those states may be related to changes in emissivity properties that occur during severe drought, as discussed here. GOES-R Cloud Thickness relates future dissipation of fog to present observations of Cloud Thickness. The last pre-sunrise GOES-R Cloud Thickness field is related to dissipation time in this scatterplot. 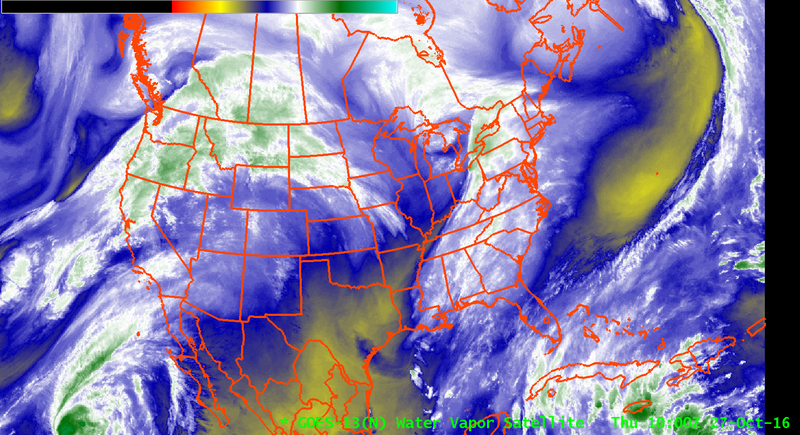 (GOES-R Cloud Thickness is not computed during twilight times surrounding sunrise and sunset) The animation below shows the thickest clouds over south-central Texas; fog over Louisiana and coastal Texas is comparatively thin. Dissipation should occur last over interior Texas. 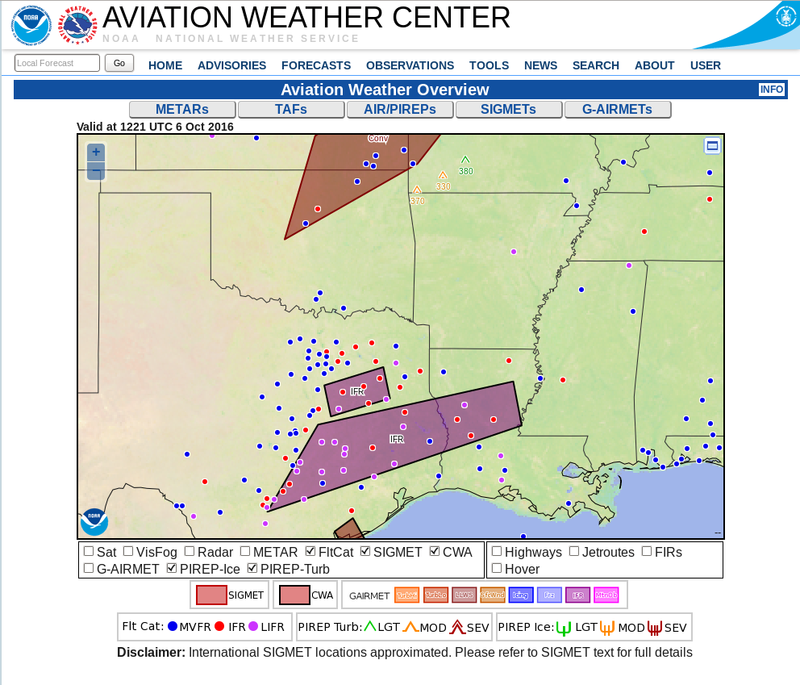 IFR probabilities were noted by the Aviation Weather Center, and Dense Fog Advisories were issued along the Gulf Coast for this case. This entry was posted in Deep South, Dissipation Time on October 31, 2016 by Scott Lindstrom. The toggle above between the GOES-R IFR Probability fields at 1107 UTC on 6 October, and the corresponding Brightness Temperature Difference field from GOES-13, is an example of the strength of the GOES-R IFR Probability field. 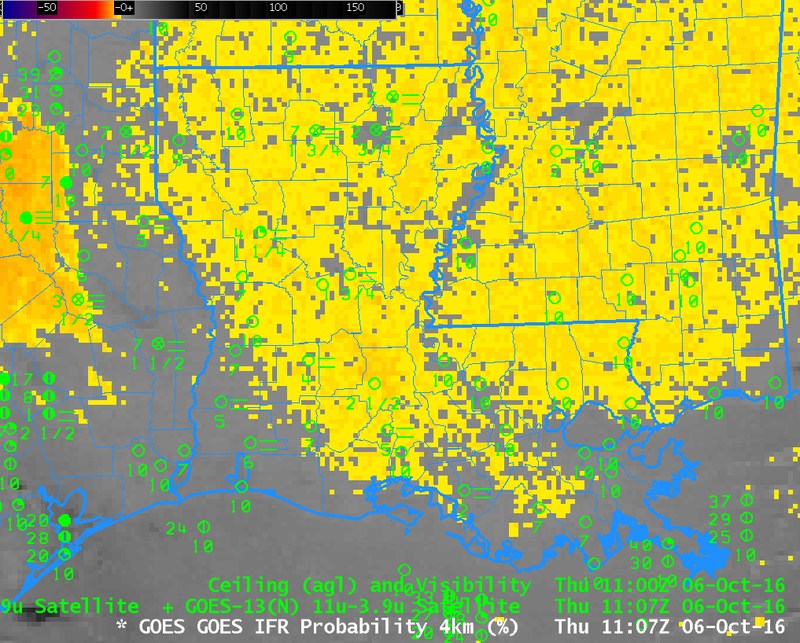 By fusing Satellite Data with model (Rapid Refresh) estimates of low-level saturation, the Probability field is able to differentiate between regions where Brightness Temperature Difference fields are showing a signal but where widespread low-level fog is not occurring (Mississippi) from regions where Brightness Temperature Difference Fields show a signal and where IFR conditions are present (Louisiana and Texas). 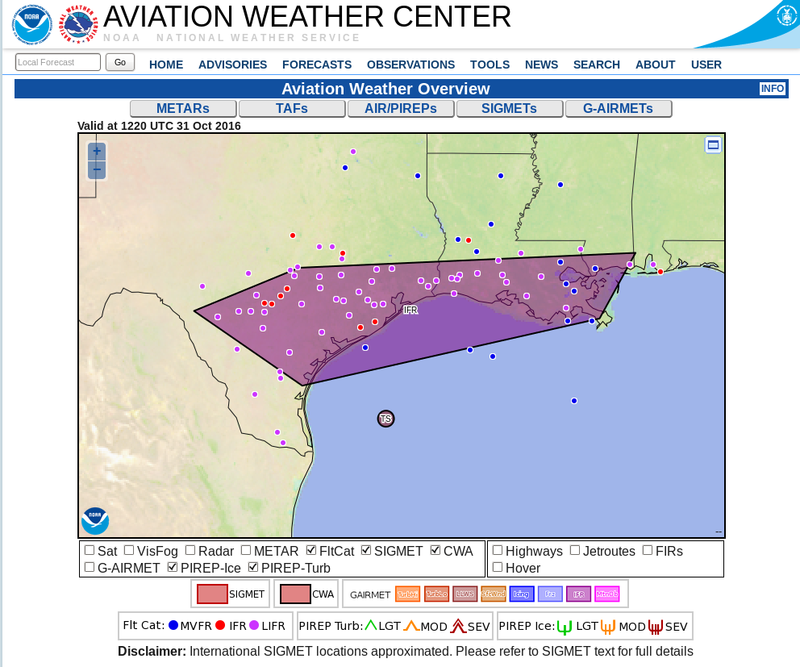 An IFR SIGMET was issued associated with the Fog over Louisiana and Texas. This entry was posted in Deep South on October 6, 2016 by Scott Lindstrom. 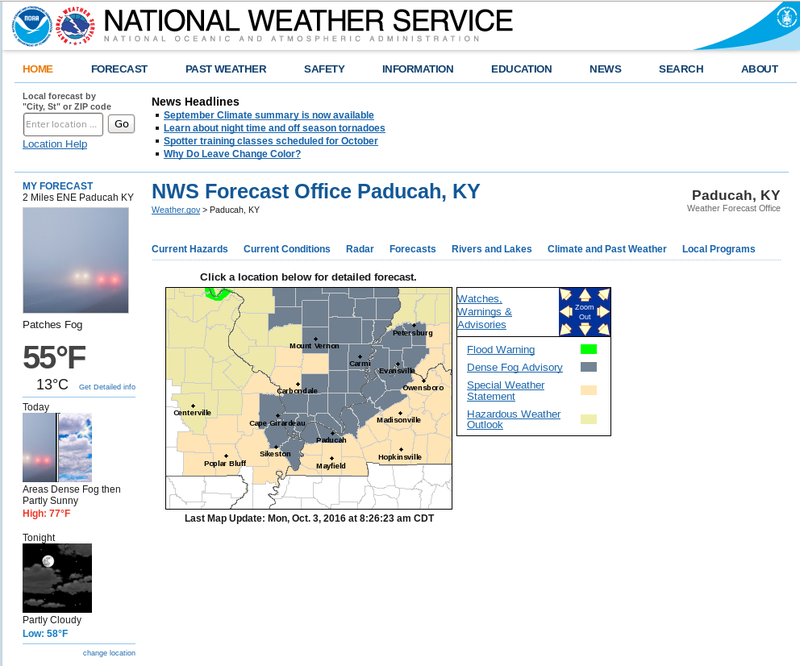 Fog developed over portions of the Ohio River Valley from Indiana westward to the Mississippi River at Cairo IL on the morning of 3 October 2016. 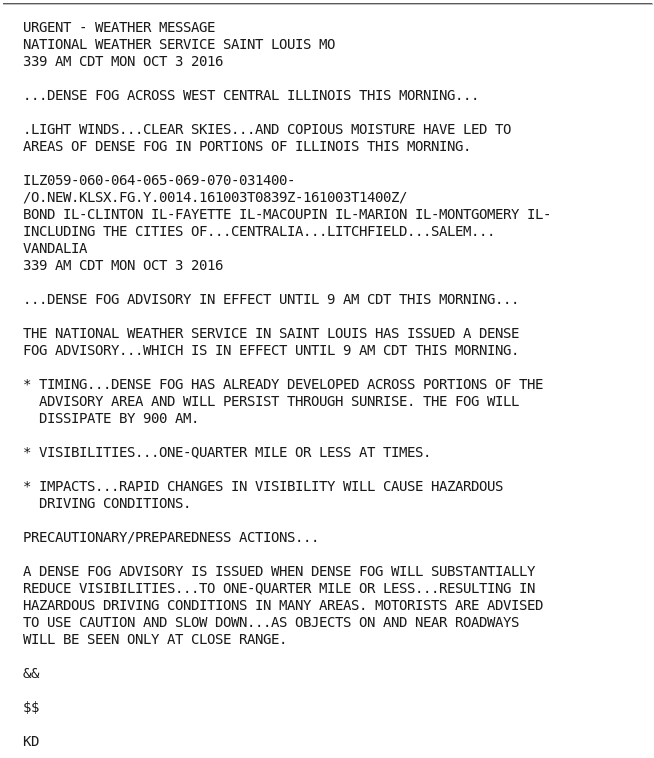 Dense Fog Advisories were issued by the National Weather Service Offices in St. Louis, Lincoln IL and Paducah between 3:30 and 4:15 CDT (0830 to 0915 UTC). A SIGMET was also issued. How effective was Satellite detection of this developing fog? The brightness temperature difference product, below, shows hourly measures of water-based clouds, a detection that keys off the emissivity differences of water based clouds for 3.9 radiation (at which wavelength near-blackbody emission is not occurring) and 10.7 radaiation (at which wavelength near-blackbody emission is occurring). Significant changes to the brightness temperature difference field did not occur until after 0500 UTC. In addition, Brightness Temperature Difference fields overestimated the region of developing fog. In contrast, the GOES-R IFR Probability field, above, showed a more gradual increase from 0200 UTC onward, and the region of the strong signal was better confined to where dense fog developed. 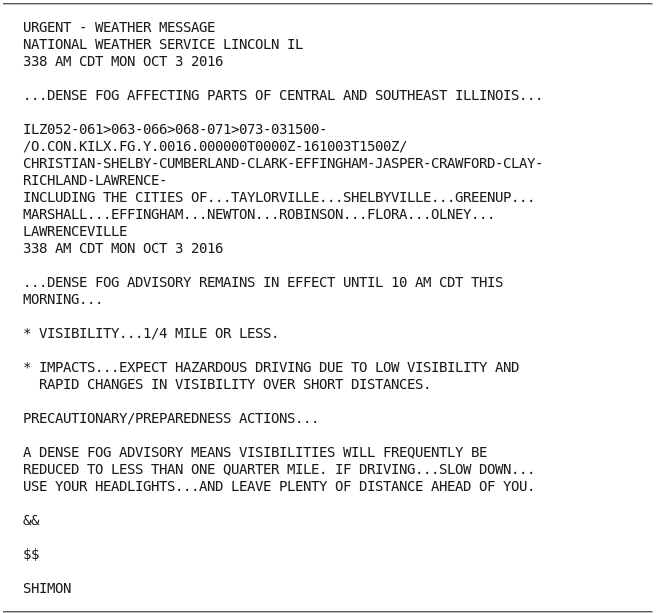 On this day, GOES-R IFR Probability fields were better for situational awareness, generating an earlier alert for forecasters to the potential for fog. 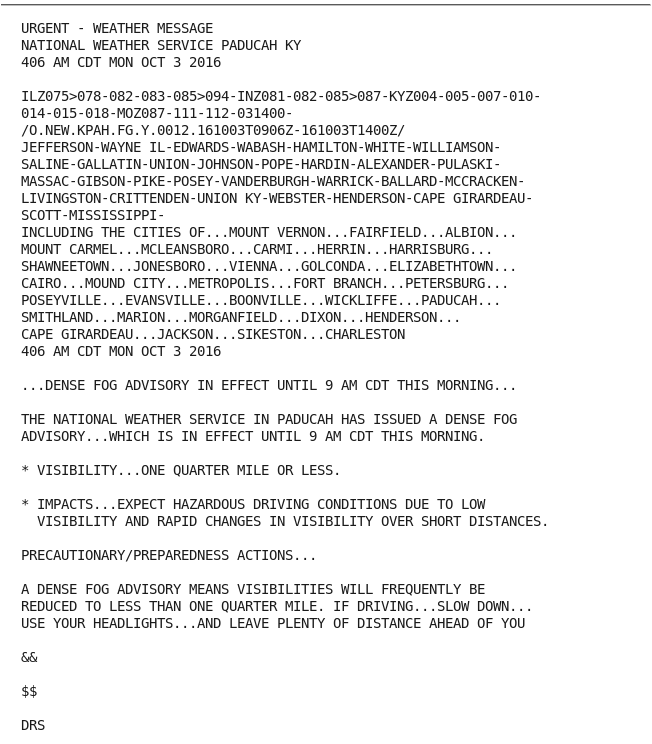 In addition, the GOES-R IFR Probability fields better defined the region of hazardous ceilings and visibilities. This entry was posted in Deep South, Midwest on October 3, 2016 by Scott Lindstrom.